Pardon the picture (getting dark at 4:30pm does NOTHING for my dinner pictures), but I just had to share this recipe with you. I love simple slow cooker recipes that taste like you spent hours in the kitchen. The hardest part of this recipe was spending 10 minutes searing the beef (if you even count that hard). 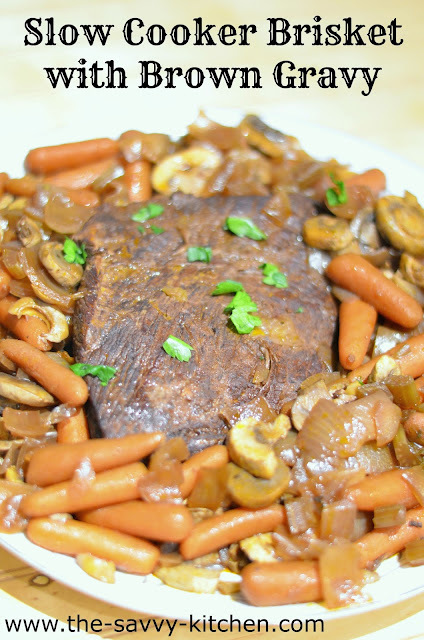 Other than that, you basically throw everything in the slow cooker and a few hours later you get tender brisket and vegetables with an incredibly flavorful gravy. Ideal for these chilly winter nights. Enjoy! And HAPPY NEW YEAR!! To the slow cooker, add the parsley stems, celery and bay leaf. Put the seared brisket on top of the vegetables. In a large bowl whisk together the broth, wine, tomato paste, and pot roast seasoning. Pour the mixture over the brisket, top with onions, and cook on high for 4 to 6 hours or low for 8 to 9 hours, until the meat is fork tender. Halfway into cooking, add the carrots. One hour before the brisket is done, add the mushrooms. Remove the meat, onions, carrots, and mushrooms from the slow cooker and set aside. Strain the liquid into a medium pan over medium-high heat. In a small bowl, whisk together the gravy mix with 1 cup of cold water. Turn the heat to medium and whisk the gravy mixture into the brisket liquid. Cook until thickened, about 2 minutes. Skim any fat off of the top. Slice the brisket and arrange it on a serving platter. Serve it with the onions, carrots, mushrooms, and gravy. Garnish with the reserved chopped parsley leaves and serve.